Cycling Knee Problems - Local Articles - Mountain Bike Cumbria - beautiful trails and information from throughout the Lake District and beyond! Knee Pain, Knee Injuries and Iliotibial Band Syndrome - A Guide to the Treatment and Prevention of Knee Injuries and Iliotibial Band Syndrome! Knee injuries are very common among runners and cyclists. However, they doesn't usually occur in an instant, like a hamstring strain or groin pull, but commonly starts off as a twinge or niggle, and progress quickly to a debilitating sports injury that can sideline the best of us for weeks. The diagram to the right shows the anterior (front) view of the right thigh muscles. If you look towards the top left of the diagram, you'll see the tensor fasciae latae muscle. 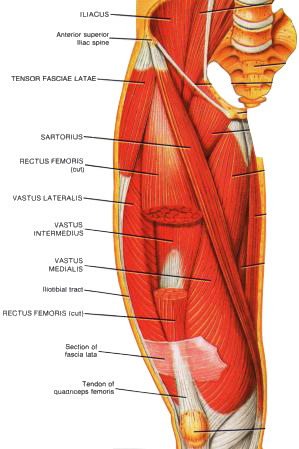 Follow the tendon of this muscle down and you'll see that it runs all the way to the knee. This thick band of tendon is the iliotibial band. Or iliotibial tract, as it is labelled in the diagram. Before any activity be sure to thoroughly warm up all the muscles and tendons that will be used during your sport or activity. For a detailed explanation of how, why and when to perform your warm up, visit http://www.thestretchinghandbook.com/archives/warm-up.htm. To keep your muscles and tendons flexible and supple, it is important to undertake a structured stretching routine. For an easy-to-use, quick reference guide of more than 100 clear photographs of every possible sports related stretch, for every major muscle group in your body, get a copy of The Stretching Handbook. If you're interested in stretches for the upper legs, hips and backside, The Stretching Handbook has detailed photographs of 36 different stretches you can do. Learn more about The Stretching Handbook here. If you are in too much pain to resume normal exercise, consider swimming, deep water exercise, or maybe cycling. Otherwise, the following web site, http://www.thewalkingsite.com/knee_exercises.html has a list of simple, easy strengthening exercises for the muscles of the upper leg and knee. To keep your knees in tip-top condition practice these regularly. This trail has been viewed 77935 times!